Approved golf attire must be worn. All shirts must be tucked into trousers or shorts except ladies shirts which are designed and shaped to be worn outside. Gentlemen must have shirts with collars and sleeves. Polo neck or roll neck ‘tiger style’ shirts may be worn. Ladies shirts must have a collar but may be sleeveless. Headwear must be worn in the appropriate way. All shorts must be tailored and knee length and worn with either knee length plain coloured socks or ankle length white socks. Ladies may wear calf length trousers and trainer socks. Trousers must not be tucked into socks unless worn under waterproof trousers. Golf shoes must be worn. 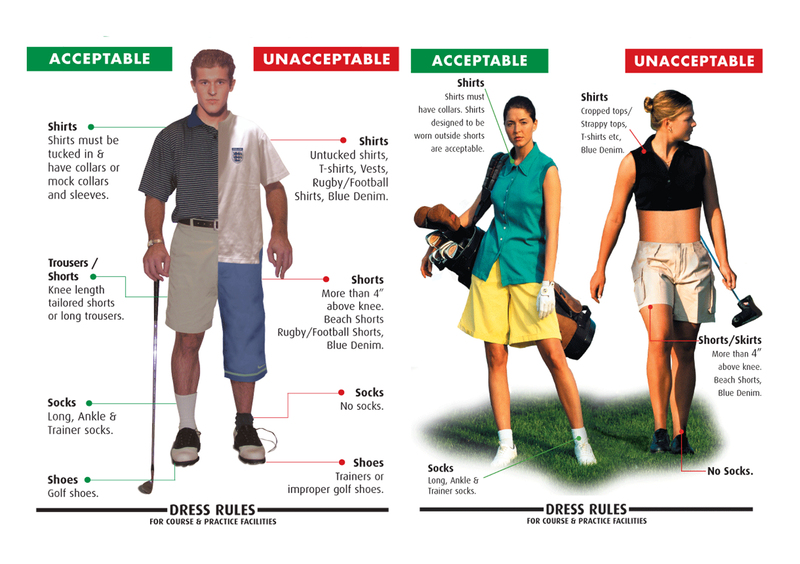 Any of the above is appropriate except golf shoes may not be worn in the clubhouse. Gentlemen must wear socks at all times. Golfing head wear, waterproofs or wet golf attire must not be worn in the clubhouse. Smart casual wear is acceptable except at formal functions. T shirts, blue denim trousers, tracksuits, combat/cargo style shorts or trousers, trainers, beach wear.